Our dining experience started off a little rocky. After about twenty minutes of trying to flag down the waitresses zooming past our table, we were briefly visited by a very terse, abrupt server who took our drink order. 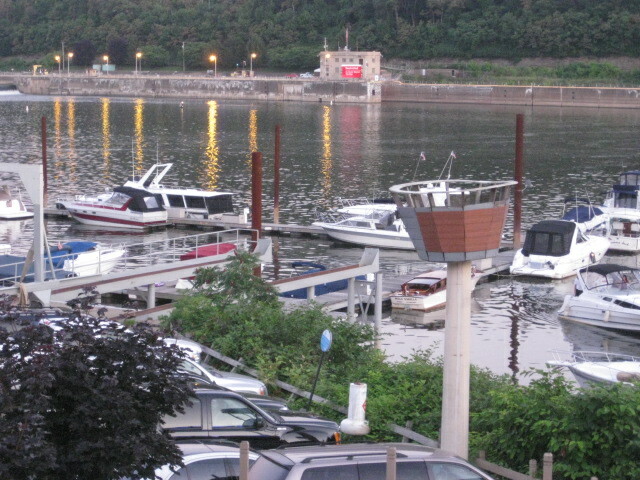 The drinks took another fifteen or twenty minutes to appear, upon which we finally were able to order our actual meals. The meal itself didn’t start off so great either. 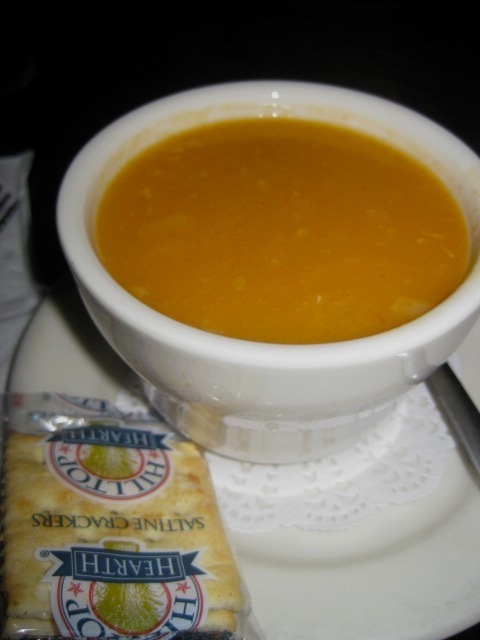 The lobster bisque had a orangeish-brown color and the consistency of Manhattan Clam Chowder, only thinner and with salt in place of any other significant flavors. At a mere cup, the sodium level was intolerable to most of our tastebuds, so we gave up about halfway through to concentrate on our shared appetizer. The shared plate of crab fritters were considerably more successful than the soup, due mainly to the sheer amount of crab stuffed into each of the fried cakes. 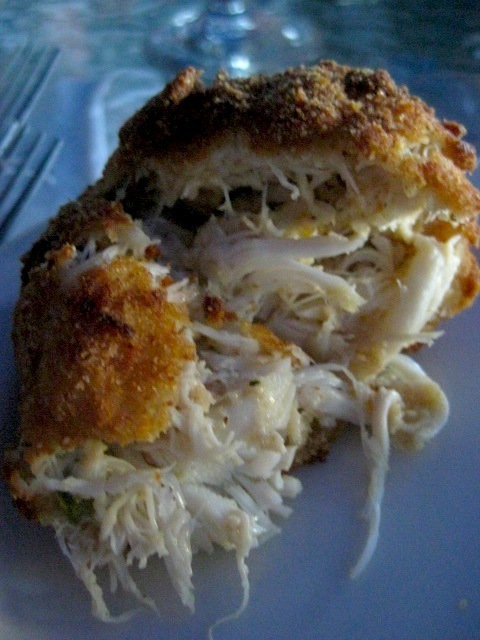 Each fritter was about the size of child’s fist and packed about as much flavor as there was crab, but it’s the breading that deserves special mention. Reminiscent of a hush puppy, it was crunchy and savory and showed the kind of restraint with salt that would have been welcome in the lobster bisque. One minor criticism: The texture was a bit too uniform for a fritter this size, but throwing in some small addition would help break it up. 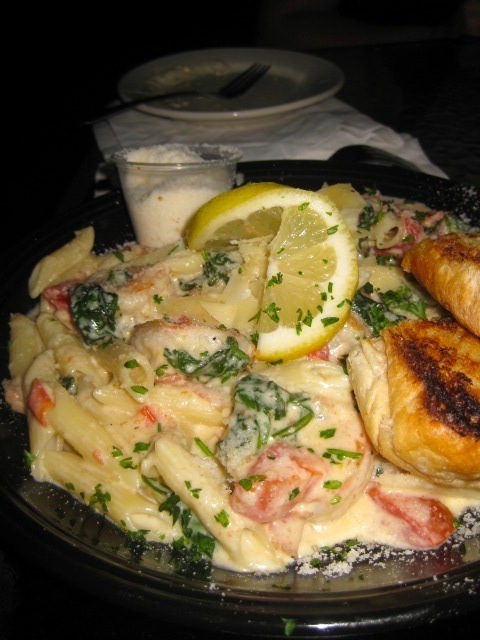 Meg’s mom ordered the Shrimp Isabella, with shrimp, prosciutto, spinach, and tomatoes in a garlic alfredo sauce. The prosciutto and tomatoes gave a necessary pop of salt and acidity to the heavy cream sauce, which was also well supported by the choice of penne as the pasta. The heartier pasta noodles threaten to overwhelm slighter sauces, but they are perfect for an alfredo. The spinach was nicely wilted but not overcooked, and the shrimp had a nice resistance to each bite without being rubbery. Meg’s scallops boasted the same good eye for preparation. Scallops are easily ruined, so we all appreciated how tender and flavorful these were. 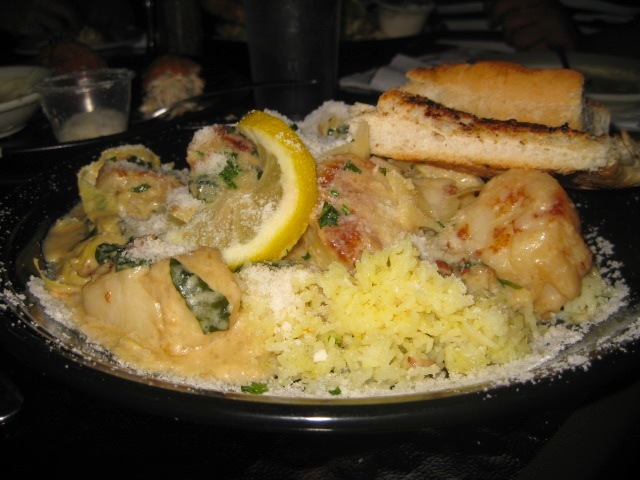 The cream sauce was a little lighter than in the Shrimp Isabella and even boasted a mild kick of spice. The proportion of the other ingredients in the dish was off, however, relegating the other featured items to minor textural counterpoint. I should have followed the other ladies’ lead and ordered a pasta dish, but I was tempted into the lobster roll special. It was an overall disappointment, starting at the very foundation of the sandwich: The bread. 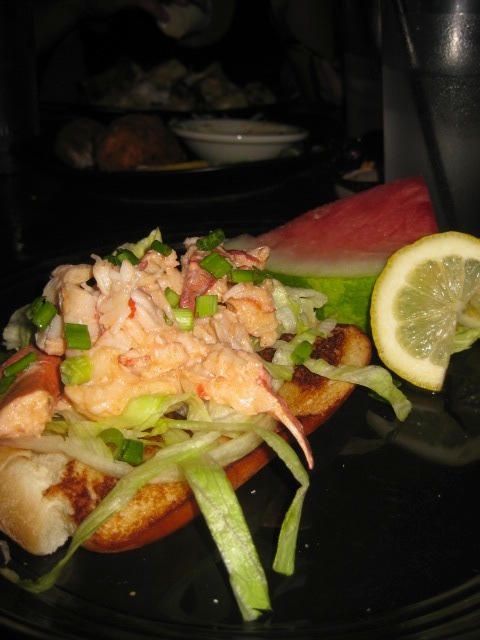 Instead of a robust loaf or bun, I received a thick slice of Italian bread halved to accommodate the lobster salad. The result was a soggy mess, as the improvised bun was no match for the wet, heavy weight of the lobster. Even toasted the bread was wilted before the first bite. But even proper bread would not have saved the dish. Whereas the other seafood entrees at the table had the benefit of sauce to cover possible notes of the freezer, the lobster was unadorned and served in all of its defrosted glory, the dominate flavor in an otherwise bland mix. It wasn’t inedible, but it wasn’t exactly tantalizing either. Thankfully, between the large slice of watermelon and the robust side dish of veggies (including a mini corn on the cob), I had more than enough food to satisfy my appetite. If I had not, my fellow diners would have been more than happy to unload some of their ample portions onto my plate. Silky’s Crow’s Nest could easily skate by on its location, and there’s no arguing that there’s some of that attitude present in the way the restaurant is set up and the manner and presentation of their servers. But aside from a few missteps, the overall quality of the food was higher than one might assume. Stick to basic sandwiches, burgers, and pasta, and you’re likely to have an enjoyable meal in addition to the enjoyable scenery. 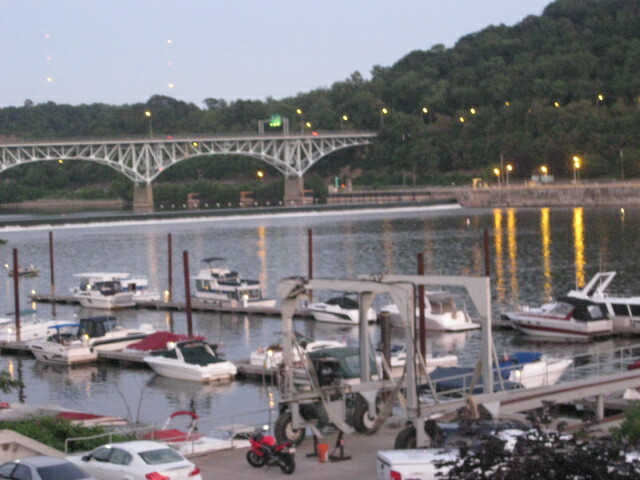 This entry was posted in Dining Out, Dinnertime!, Food and tagged bar, crab, dining out, dinner, lobster roll, outdoor dining, pasta, pasta dish, patio, pittsburgh dining, pittsburgh restaurants, Restaurant, riverfront dining, riverside dining, sandwich, seafood, sharpsburg, sharpsburg restaurant, shrimp, silky's, silky's crows nest. Bookmark the permalink. Good for business meetings, though–very little time wasted on discussing the subtleties of the food’s flavor, and most out-of-towners are pretty impressed.